You may have heard rumors about the downfall of the sedan. “Manufacturers have axed almost their entire car line-up; SUVs are taking over!” the headlines read. While the sedan-apocalypse may have already occurred for some, this certainly isn’t the case for Toyota cars. Led by the best-selling Camry and the hybrid-extraordinaire Prius, Toyota’s selection of available sedans is as strong and reliable as it has ever been. There is truly a Toyota for every driver, from the 86 for sports-enthusiasts to the commuter-loved Corolla and Camry. Get to know these sedans and make sure to head to your local leadership to learn more about the right Toyota car for you. If you’re looking at the Yaris thinking you’ve gone crazy because you could have sworn you saw the same vehicle wearing a Scion badge, don’t worry! The Yaris began life as a member of the now-defunct Scion brand. Although the iA-branding may not have lasted, the Yaris has lived on as an excellent subcompact. Whether you opt for the spacious Yaris liftback (30 mpg city/36 mpg highway) or the sleek Yaris sedan (32 mpg city/40 mpg highway), you’ll be getting a combination of efficiency and advanced technology. A standard 7-inch infotainment screen keeps you connected with a quick touch or voice commands. Bluetooth connectivity and two standard USB ports make sure you’re never at a loss for tunes or a quick charge. Those known for balling on a budget should opt for the XLE, which adds leather seats and trim to the chrome accents while retaining an MSRP below $20,000. The Yaris also refutes any claims that subcompacts are unsafe. With an active safety suite and low-speed pre-collision system, it’s no wonder that this spunky car received a five-star rating from the NHTSA (National Highway Traffic Safety Administration). A compact car should be a good combination of style and function. The sporty 2019 Corolla and Corolla Hatchback meet that standard and more. The first thing you’ll likely notice about these twins is their beautiful, modern styling. The sharp front-end and swooped roofline show that this isn’t a boring compact car. The exciting exterior is a preview of the airy cabin that, in the hatchback, can hold more than 23 cubic feet of cargo with the 60/40-split second-row seats down. Other interior highlights include standard Apple CarPlay, Toyota’s Entune audio system and a 7- or 8-inch touchscreen. On the road, both Corollas offer 30+ combined miles-per-gallon, with the hatchback hitting a terrific 38 mpg on the highway. Best of all, both models start at below $20,000. In the compact class, there’s no bang for your buck like the 2019 Corolla. If the Prius hasn’t reached icon status yet, it’s surely close. The 2019 Prius delivers the same function and efficiency in three equally appealing packages. City dwellers will love the appeal of the bite-size Prius c, which offers 48 mpg city/43 mpg highway with the flexibility of a small hatchback. The traditional Prius now offers a whopping 54/50 mpg in the familiar body-style so many Prius users love. Those who like things more electrified should look to the plug-in hybrid Prius Prime, which will achieve north of 125-electric miles per gallon. Inside, the Prius and Prius Prime let an 11.6-inch HD multimedia display do the talking. When paired with Toyota Entune, this smartphone-esque touchscreen helps you control music, navigation and everything in-between with a swipe. The Prime takes the tech even farther with Prime apps, including a remote climate app that lets you set the temperature before you get in; there’s no better way to get a hot or freezing cold car back to a comfortable temperature. Simply put, the Prius isn’t going to lose its spot atop the hybrid world anytime soon. Below the sheet metal, the Camry remains all-business. The base 4-cylinder engine offers a commendable 203 horsepower, but those who like a little more speed should opt for the 300 horsepower and 267 lb-ft of torque V6. The eco-friendly will enjoy the Camry Hybrid’s 50+ combined miles-per-gallon. Inside, the Camry remains a comfortable cruiser tailor-made for the commuter. Optional sumptuous leather and wood trim accents envelope all five passengers. Standard Apple Car Play keeps you connected to the outside world while the Toyota Safety Sense Suite keeps the ride safe. Like many of its Toyota brethren, the Camry earned a NHTSA five-star rating. With the way things are going, the Camry should remain a class-leader for years to come. At the top of the Toyota sedan food chain is the stately Avalon. This luxurious car is as refined as they come. Inside, the Avalon takes connectivity a step-further with optional smart-watch connectivity that allows you to start the car with a simple tap on the screen. A 7-inch multi-information display screen in the dash can display speed, fuel level, safety features in use and turn-by-turn navigation. Inside the hushed cabin you’ll find heated and ventilated front seats, two-tone stitched leather, and genuine wood trim on the dash and door panels. The floating center stack is topped by a 9-inch touchscreen for all your infotainment needs, and you can wireless charge your phone on the mat located down by the cupholders. 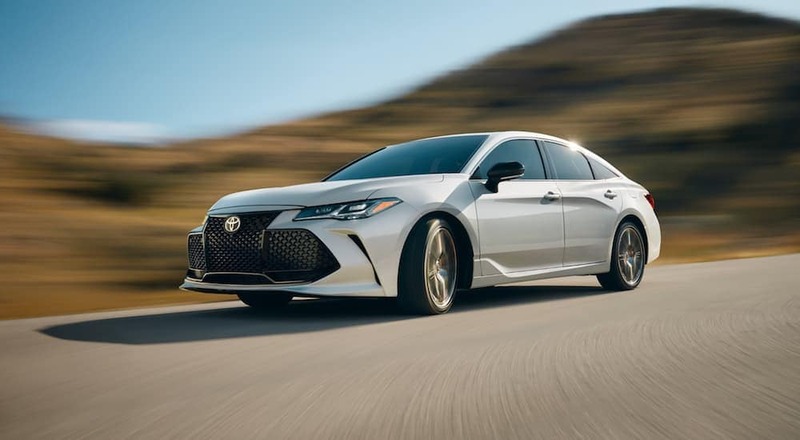 While all this luxury might sound like it belongs in a gas guzzler, the Avalon gets 22/32 miles-per-gallon for the gas engine and a downright thrifty 43/44 combined mpg in hybrid form. Be careful when you get into the 2019 Avalon, because you may never want to leave. Developed in coordination with Subaru, the 86 is a true sportscar with everyday usability. Track fiends will opt for the manual-only TRD Special addition that pairs Brembo brakes and SACHS performance dampers with front, rear, and side underbody spoilers that keep you glued to the ground. Other specialty features include a unique tricolor side-body graphic and performance exhaust. Inside you’ll find premium red and black sports seats with suede upholstery accents. All 86 models come with a standard 7-inch touch-screen infotainment system. 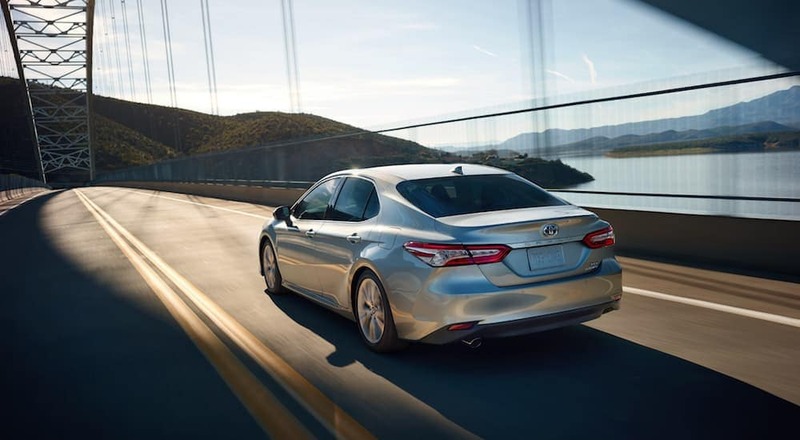 Automatic drivers who opt for the base model or GT won’t be disappointed by the 86’s excellent weight distribution and speed; the 200-hp 4-cylinder engine produces more than enough power for the incredibly light (2,776 lbs.) coupe. For the price, there is truly no sports-car that comes close to the 86. It feels like a cliché, but there is honestly a Toyota for every type of driver. The entire line-up presents buyers with a slew of technology, efficiency and luxury, all with the reliability with which Toyota is synonymous. 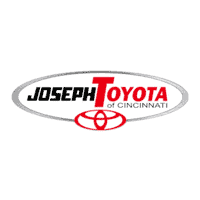 Don’t wait, contact your local dealer today to learn more about Toyota cars and find the one that’s right for you!